8948 Gavla is a BIONICLE set released in January 2008. 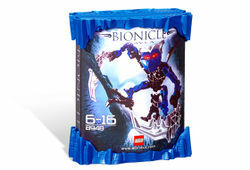 It includes 14 pieces to build a small model of a shadow Matoran named Gavla that can be attached to 8692 Vamprah to depict her riding on his back. In the BIONICLE storyline, Gavla was a blue shadow Matoran. She was the first Av-Matoran to be corrupted and served as Vamprah's eyes, because he is blind. She was later cured of her shadow corruption accidentally by Takanuva. She is now living on Spherus Magna, but misses the acceptance and power she wielded when she was serving the Makuta. This is a description taken from LEGO.com. Please do not modify it. (see an archive of the product's page) Out for revenge! The first Matoran of Light to be corrupted by the Makuta, Gavla is out to avenge years of being shunned by her own people. Combine with 8692 Vamprah to threaten the freedom of every Matoran! Gavla has red eyes, wings and 3½" (9cm) long twin blades! This page was last edited on 28 April 2016, at 18:08.